Screw it, I’m gonna run! At last report I’d decided I was going to let my running come to me—unplanned and in small doses, when the mood struck me or I couldn’t help myself, thankful for what I could get but with no expectations. Well, that didn’t last long. Once I realized I could run (even on a limited basis) and not hurt my knee (at least apparently not make things worse), I was plotting out a rough schedule for my triumphant (ah, I hope) return to running. And really, how could I help myself? It seemed to me everyone else was running. First off, my son started the cross-country season with an 18:25, knocking over 20 seconds off his PR. When I saw him come through the mile mark in that first meet with teammates he wouldn’t have been able to keep in sight last year, I couldn’t help but point him out to the stranger who was watching the race next to me then dash (well, limp) across the park to see him at the next spot. By his third meet, he was down to 17:49 and I can see he’s got much faster running ahead of him. Even if he wasn’t having success, there’s really no place like a high school meet to put a person in the mood for running—I mean, herds of kids rolling across the grassy fields, rambling through the woods, sprinting for the line, decimating themselves—any runner watching will feel compelled to do the same. But it’s not just him, every morning I check the latest news on let’s run. I read other blogs too, and my fellow bloggers report on their running! 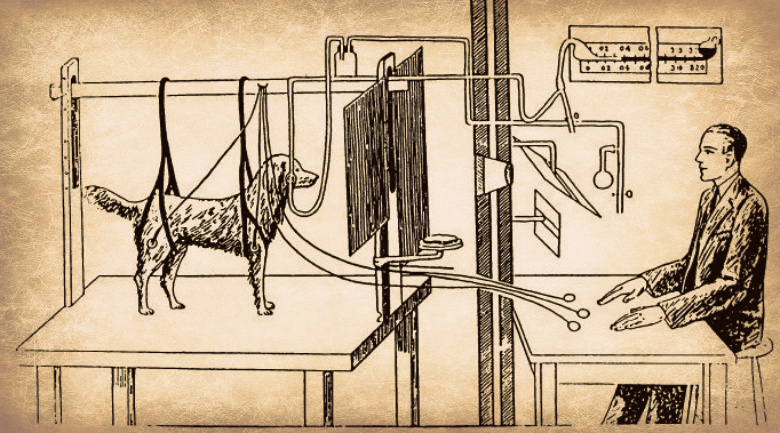 Sometimes, like Pavlov’s dogs, I literally salivate when I read about races, 20 mile runs, and weekly mileage totals. This doesn’t make sense, of course, unless I need running like I need food, unless it’s become an essential part of my existence. On top of that, I’ve been seeing it in places I don’t expect. 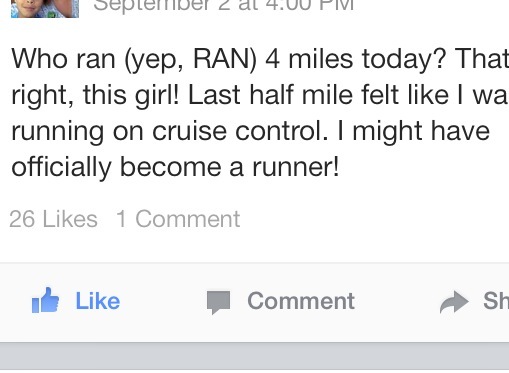 For example, my lovely perfect wife’s cousin, a lifelong non-runner, reports on Facebook that she’s now a runner. My nephew, who’s told me he doesn’t like running, is halfway through his middle-school cross country season (highlights include an asthma attack and getting stung in the achilles by a swarm of yellow jackets), my friend’s wife Holly, a big fan of this blog (ha!) and self-proclaimed non-runner, has built up to 4 miles. My lovely perfect wife and I are going to Colorado in October. I contacted my friend there to see if he was free for dinner on the 19th. He said, Sure, let’s go out for pasta—I’ll be carbo-loading for the Denver Rock and Roll marathon the next morning! Of course, even with all this, I wouldn’t have started up again if I didn’t feel ready for it. I’ve still got pain and my leg is still weak, but it occurred to me that no matter when I began again, it was going to be hard. I thought maybe I needed to run to get my body in shape to run, that the very thing I’ve been avoiding is the only way out, and that I’ve got to confront the pain instead of avoiding it to get my knee strong again. While my previous runs have been unmeasured and untimed, I decided I should do my new workouts on the track. I liked the idea of starting from scratch, 100 meters at a time. Plus I wanted to be sure the surface would be consistent for every step. I also wanted to know how far and how fast I was going and figured it would be better to run in shorter spurts, paying strict attention to my form to keep myself from favoring my right leg. But I think the main reason I wanted to go to the track was so I could pay close attention to my running, be focused on that and nothing else. Sure, the goal of lots of runs is to relax and let one’s mind wander, see things and lose track of everything, but I didn’t want that. I mean, for the last 11 months my mind has been wandering to thoughts of running, so why would I want to dilute the experience with other people or beautiful scenery or anything else? When I got to the track the first time I walked around a few times to warm up, then timed myself for 100 meters, focusing on good form. 23 seconds. Not bad, I thought, as I walked the curve. For the next one I ran 22 seconds. Times don’t matter, I told myself, but old habits die hard, I guess, because for the remaining 6 100’s, I tried to maintain that speed, and even got down to 20 on the last one. My knee hurt a little at the onset but loosened up nicely. Though definitely weak, it seemed fine afterwards. No swelling and pain only up steps, which had been the case beforehand as well. For my next workout (5 days later) I ran 4 200 meters repeats at the same speed (averaged 40 seconds, last one in 39). My knee felt the same as the first time. Five days later I was back at the track and ran 6 300’s in 62, 60, 60, 58, 58, and 57 (that’s just under 5:20 per mile pace for those of you who haven’t already translated it in your heads). Coming down the final straights for those repeats was tough, tough, tough, but what an exquisite form of torture. In all my other hard training since getting off my crutches in February, there was nothing quite like this, nothing that put me up against the edge of oblivion like digging in to cover those last stretches of track. Of course, I loved it as I guess there’s nothing quite like that mix of pain and exertion to make me feel alive and whole. After the 4 days it took for the soreness from that workout to dissipate, I was back on the track for 400 meter repeats (why “just do it,” when you can “just (over) do it,” right?). The first 3 were at 84, 83, and then 81. My left hamstring tightened up a bit, so I backed off but still averaged 83 for 6 of them. Not bad, I told myself. Not bad, considering everything. For my next workout (a wonderfully dark and rainy morning), I told myself to back off on the intensity, and after my warm up, ran a mile in 6:38, stopped, caught my breath, then ran another in the opposite direction in 6:32. Maybe the slower pace made the difference, but it felt like my leg had gotten a little stronger. Again, no big problems afterwards. And so how does it feel to be running again? Well, there’s the exhilaration I’ve just tried to describe, the satisfaction of the craving I’ve had for so long. But there’s also trepidation, wondering if that stabbing pain is going to return. And I feel awkward, my form and rhythm off kilter, my body not quite remembering how to bend and un-bend itself in the right ways yet. And in some ways I feel foolish too—that I’m doing this too soon and all wrong, that I’m going to look back and chastise myself for these workouts, the last ones I’ll ever be able to do. Coming back from microfracture is just such a mystery. There’s so many different stories out there—successes, failures, and surrenders. I don’t know what mine will be yet. Before the first of my track workouts I was leaving the locker room at work and one of my colleagues, an ex-athlete himself, who saw me on crutches the first 6 weeks of the year, who’s watched me limp around since then, asked me if I was going to run. “I’m going to try,” I said. I laughed and nodded, because he was right, of course, because I knew I might be making a huge mistake, but I thought to myself, Screw it, I’m gonna run! And so that’s what I did. And that’s what I’ve done. And so far, well, so good.